The ultimate streaming music solution for business. No ads. No contract. No worries. Fully licensed with no ads or interruptions. All music screened for lyrics and certified for business use. Create multiple mixes. Make easy adjustments with our innovative Mood Mix Board. Like or block songs to fine tune your sound. Different kinds of music for different times of day? No problem. Set schedules easily and override at anytime. 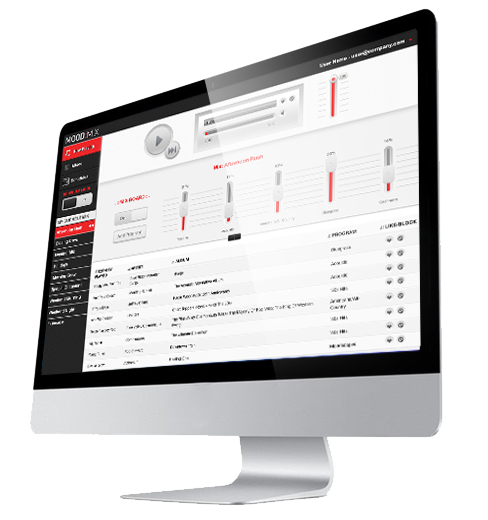 Manage your music with ease using our intuitive mix platform. Login, select your favorite music and click play. No new hardware required. Bring your own computer or tablet, connect to your sound system and start listening. We know you’re gonna love it, but you can cancel your month-to-month subscription at any time. Create as many custom mixes as you like to set the perfect mood. Tweak and edit to dial in the vibe. See what song, artist and album are currently playing. Like or block songs to fine tune your sound. Open the calendar and easily schedule your mixes to play at the right time on the right day. 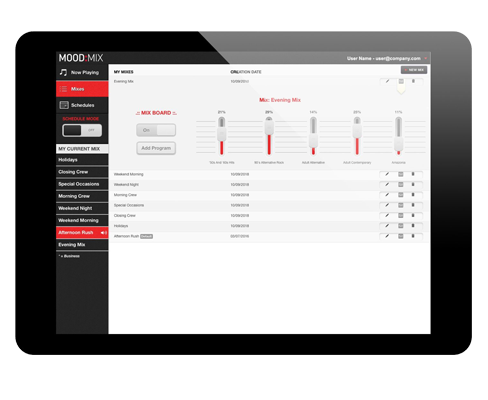 TAKE CONTROL OF YOUR MUSIC WITH MOOD MIX. Create your own custom music mix and fine-tune your soundtrack at the click of a button.